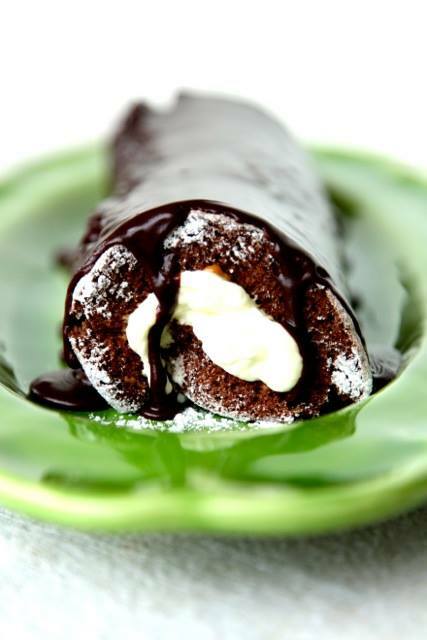 An oldie but a goodie and an enduring family favourite, this Chocolate roulade remains a classic for very good reason. Heat oven to 190°C. Line a sponge roll tin with nonstick baking paper. Combine cocoa and boiling water in a small bowl and stir to form a smooth paste. Place eggs and sugar in a bowl and whisk until thick and pale. Whisk in the cocoa mixture to just combine. Sift on the flour and baking powder and fold into the egg mixture. Spread mixture into prepared tin and bake for 10 to 12 minutes or until puffed and set. Remove from oven and turn out onto a clean tea towel dusted with icing sugar. Roll up and leave to cool completely. Unroll log, spread surface with jam and then whipped cream. Roll back up again to enclose filling. Ice with simple chocolate icing. Slice to serve. To make the chocolate icing, sift the icing sugar and cocoa into a bowl. Add butter and boiling water and stir until smooth. This entry was posted on August 22, 2017 by julie.